Ping Craz E Putter. The oddest putter ever made? The Ping Craz E isn't what you'd describe as a conventional putter. 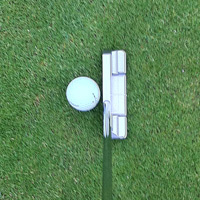 As you can see it's more or less a mallet putter, but with holes and weights in places you wouldn't expect. The blue inserts don't appeal to my eye, but I'm sure that's just a matter of taste. 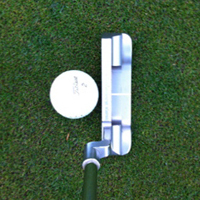 In that regard it falls into the same category as the Ping Anser G5i. One major plus point it has is that its shape makes it really easy to align. The shape of the weight on the back mirrors the shape of the ball and the depth of the putter allows for a very long alignment line. It and the blue area that flanks the line make for an excellent aiming device. The fact that the rounded weight is set so far behind the face of the putter also gives you the feeling that this a putter which will naturally swing through the ball on a very straight path. It's unlikely to close or release. This is a great design for you if you use a straight-back-and-straight-through method, but won't suit you if you look to swing the putter on a curved path with the putter opening and closing to the target line as it goes. I'm afraid to say that the feel of the Craz-E was a real disappointment. I don't think I've ever tested a putter which feels more hollow than this one. I don't know whether it's as a result of the weight being located so far behind the face of the putter, or what, but either way it feels like you're wielding an empty coke can on the end of the shaft. It's a huge let down. The roll of the ball off the Ping Craz E was not much better than the feel. I found it particularly hard to get the ball up to the hole on medium paced greens. It just never seemed to get going. The feel was too soft - almost as if there was a piece of wool stuck to the face of the putter. An unconventional looking beast which, admittedly, is very easy to align. Unfortunately dreadful feel and roll really let it down from there.